Captain Robbie Wolfe and the Charter Boat Whipsaw Catches More Fish than any Other Captain based in Wrightsville Beach, NC! If you're looking for top-notch Wrightsville Beach Fishing Charters, you've come to the right place. 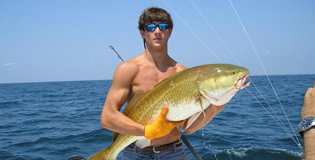 Whipsaw Fishing Charters offers the best Wrightsville Beach inshore fishing or Wrightsville Beach Deep Sea fishing in the Southeastern NC region. We'll take you and your group out Wrightsville Beach charter fishing for Mackerel, Dolphin, Grouper, Sailfish and Much More! Whipsaw Fishing Charters is located in one of the best sport fishing locations on the East Coast and is based out of Masonboro inlet. Aside from great fishing, Masonboro inlet is also one of the safest ocean entry points on the coast, far superior to others located nearby. The Whipsaw Fishing Boat has plenty of comfortable seats, places to store backpacks, and has a clean restroom onboard. She's equipped with twin diesel cats that will take you to the fishing grounds safely. The Whipsaw is fully equipped with a fighting chair and all the rigs necessary to catch plenty of large fish. We use only quality rods & reels to ensure success when you're fighting the big one! The fishing boat is tournament tested and has brought in dozens of large catches over the years. 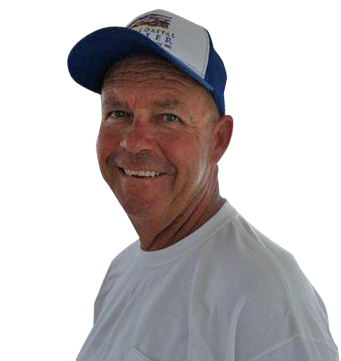 To Book Your Next Wrightsville Beach Fishing Trip, Give Captain Robbie Wolfe A Call At 910-547-0746. Captain Robbie Wolfe makes the Wrightsville Beach Fishing his full time job. Family owned and operated, Robbie guarantees that when you fish with him, you come home with a cooler full of Fresh Fish everytime. 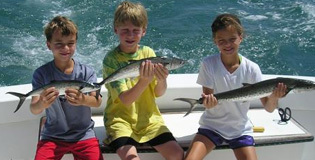 Whipsaw Fishing Charters Offers the Best Wrightsville Beach Fishing Charters in the Book! Our 1/2 Day Family Fishing Trip Special is geared toward novice anglers & Families. 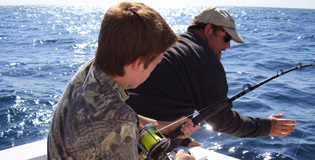 We'll take Wrightsville Beach Charter fishing for Spanish Mackerel, King Mackerel, Bluefish or Bottom Fishing for Black Sea Bass which is a crowd pleaser. Easy for the Kids and Easy on the Wallet. Call us today for your next Wrightsville Beach fishing trip. Our 8 Hour King Buster Offshore Wrightsville Beach Fishing trip is for those looking for a great deep sea charter fishing experience. You can expect to reel in King Mackerel, Mahi Mahi and the Occasional Sailfish. Big Fish, Big Fights, Big Fun! Be Sure to Ask about our Wrightsville Beach Bottom Fishing Trip Specials! Our 10 Hour Cooler Buster is for those that just cannot get enough of the Wrightsville Beach Offshore fishing charter Action that Wrightsville Beach, NC has to offer. Trolling Fishing Trips are Big Action Fun with Mahi Mahi and King Mackerel charter fishing. 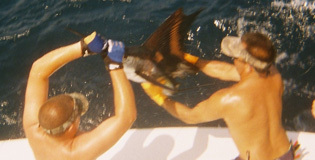 We are also happy to take you Grouper Fishing, Snapper Fishing and Triggerfish by request. Make room in the freezer for some cooler busting excitement! If you're looking for top-notch Wrightsville Beach Fishing Charters, you've come to the right place. Whipsaw Fishing Charters offers the best inshore fishing trips or offshore fishing charters in the Wrightsville Beach, NC Region. 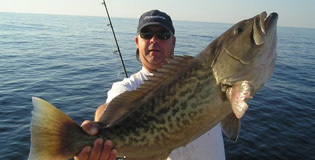 Give us a call today to get hooked up with the best charter fishing North Carolina has to offer! Aside from great fishing, Masonboro inlet is also one of the safest ocean entry points on the coast, far superior to others located nearby. What does this mean to you? It means that not only is your Wrightsville Beach Fishing Charter going to be exciting and fun, but safe as well. 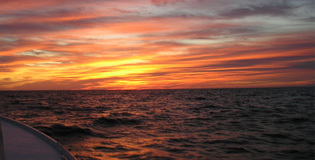 Catching Spanish Mackerel, King Mackerel, Bluefish or Bottom Fishing for Black Sea Bass is a crowd pleaser. Easy for the Kids and Easy on the Wallet.